Like so many, I have been overwhelmed by the pictures, video and stories coming out of Japan. 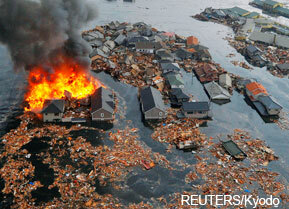 Last week’s earthquake and tsunami were horrific. Prayers for mercy, compassion and strength are lifted up to God on behalf of the survivors and victims. Two thoughts rise in my heart and mind. First, I realize that some people may be asking, “Why God allow this tragedy to happen? Could He not stop it? Or is it some kind of punishment from God?” Jesus faced such a question once when asked about eighteen people who were killed when a tower fell on them. “Do you think that they were worse offenders than all the others living in Jerusalem? No, I tell you; but unless you repent, you will all perish just as they did.” Luke 13:5. The people of Japan are no worse sinners than you or I. We are not entitled to prosperity and safety. Each day of life is a gift from God that easily be lost. Part of our repentance, transformation, is to recognized the potential folly of our human enterprise. I took basic geology in college. The professor stressed two points for all the non-geology majors: don’t build your home near a geological fault-line nor on a flood plain. Japan is located near a major fault: earthquakes and tsunamis have and will happen there. Even with the best technological structures, humanity continues to build where such destruction can/will happen. We can not blame God for our folly. But a second thought rises as well. This is again our opportunity to love our neighbor and to show grace and compassion. We each can participate in some way in the restoration of Japan and other devastated lands. I am a citizen of a nation that is already sending support; I can inform my elected representatives that I support such aide. I am also a member of the Evangelical Lutheran Church in America and I have given financial support to its Disaster Response fund. We are called now to act with the compassion of Jesus so that a tsunami of grace can touch Japan. How has the earthquake shaken your life? This entry was posted in grace, Jesus, love, service, spiritual exercise, Uncategorized and tagged ELCA, Japan earthquake, tsunami on March 14, 2011 by Pastor John Keller.